LIFE is better in PINK: Welcome to my PINK Life! Welcome to my PINK Life! Hi! I'm Lindsay! Welcome to my second attempt at a family blog (the first was very very short lived). Check out my About Me page to learn a little bit more about me and my family. Trust me when I say, I don't expect this blog to be anything special. I don't consider myself to be an expert on cooking, baking, raising babies, or peanut allergies...yet those things are what I plan to write about! Basically, I will be sharing my life with you. And with two little girls at home, my life is definitely PINK! I wouldn't have it any other way! See long before I had my baby girls, I loved the color pink. It has been my favorite color as long as I can remember. Most of the things in my kitchen are pink! After we got married in 2009 and moved into our first home (which is currently still our home) I decided to make the house very neutral...but the kitchen was MINE! John (my wonderful husband) did not cook - he since has mastered a few meals - and I knew I would be spending a lot of time in the kitchen. It was my room within our home! Therefore, it has an awful lot of PINK accessories! Now we have added two more girls and a lot more pink to our happy home! John embraces all of the pink with such a positive attitude (I am one lucky girl)! I truly believe that God blessed us with two beautiful baby girls because we were meant to have more PINK in our lives! I love these pink Anywhere Chairs from Pottery Barn Kids. 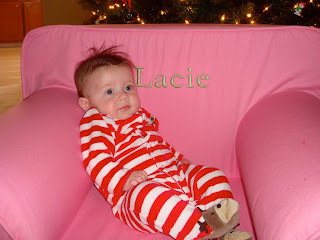 Lacie and Blakely each have a hot pink chair with green personalization! We have the oversized chairs so that the girls can get a lot of use out of them while they grow. Here is Lacie in her chair that Santa brought for her first Christmas! Another favorite pink item is the amazing B-Ready stroller. It is made by Britax and it happens to be a single that can turn into a double stroller! When I found out that I was expecting a second girl, I knew I had to have this stroller. The problem was it was 2012 and they had discontinued the hot pink fabric option in 2011. I found a store in California that had two left in stock and had one promptly shipped to my house! Here's Blakely riding in the top seat! Another awesome pink item that I use on a daily basis is this pink coffee mug from Longaberger. It is an amazing mug, and it is my absolute favorite! After receiving this pink mug as a gift, I decided a needed more of these mugs in a variety of colors so that John could use them too! He agrees that coffee tastes best out of a Longaberger mug! I have many more pink items that I love and will be sharing with you in the future! I hope you enjoyed reading my first post!